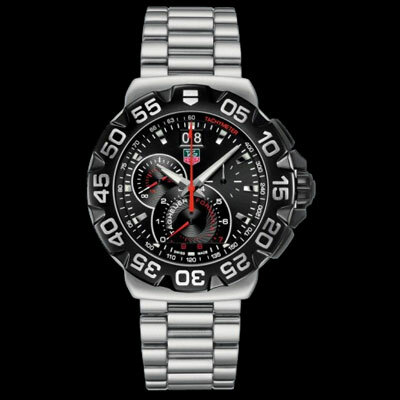 TAG Heuer Formula One, Fantastic! TAG Heuer watches are just as popular as ever, because of their high quality standards and exceptional styling. Since 1860, this watch maker has been turning out one fantastic creation, after another. The TAG Heuer Formula One Men’s Watch # CAH7010.BA0854 is another fine example of watch making excellence. 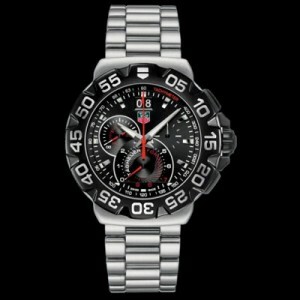 If you’re looking for a great TAG Heuer that is priced under $1,000; this is the watch you should check out. This Formula One has a men’s electro mechanical movement. The Calibre S movement from TAG Heuer is reliable and as accurate as any mechanical on the market. The dial on this watch is featured in black and offers black subdials. TAG has equipped this dial with a scratch resistant sapphire crystal with an anti reflective coating. The bezel on the # CAH7010.BA0854 is unidirectional and is presented in black, with white numbering. The case is made from strong stainless-steel and offers a screw in case back and push in crown. The TAG Heuer Men’s Watch is water resistant to 200 meters, that’s 656 feet. The look of this men’s watch is bold and brawny, but the bracelet has been introduced in a sophisticated style. The steel link bracelet is in a brushed finish and features a hidden folding clasp. You can own this TAG Heuer for $940.00. This watch does NOT use Calibre S !! !